The more perceptive among you may have noticed the casual inclusion of zucchini in a previous post. I’ve always struggled with the texture and blandness of zucchini, but I’ve decided that this will be my year to come to terms with summer squash, and I’ve already made a good start. There wasn’t a whole lot in the way of fresh produce at the farmer’s market yet, being a little early, but I came home with pints of strawberries, bags of wild mushrooms, a mound of fresh dill, and three large zucchini (it’s a little early for them too, I know; I think they were locally grown in a hothouse). The lamb kebabs was my first effort to integrate zucchini into a meal, and it worked out pretty well. The quick marinade I used gave it some flavor, and grilling made it nice and tender without turning to mush. But that only used up one of my three zucchini. That left one for Z-P muffins, and one for… something else. I wanted to put my new kevlar glove, courtesy Mother’s Day, to work, so I decided on halibut wrapped in paper-thin slices of zucchini, which required the use of my mandoline. I’m not really happy with the one I have—it doesn’t have a kickstand base, and there is a big hook on one end for the hand-grip (which I no longer need thanks to my handy-dandy glove) that gets in the way when I have to slice something long, like zucchini for instance. Half of my strips were consequently sort of mangled, but I got enough nice ones to wrap my fish with, and the rest took a spin in the food processor to become muffin fodder. As for the fish, I used chunks of wild halibut, seasoned with kosher salt, lemon pepper and sprigs of fresh dill. The zucchini strips formed a little packet around the fish, keeping it moist as it sauteed but adding very little flavor or texture of its own. I turned up the heat at the end to give the zucchini a little color, and served it with garlic-mashed potatoes and a quick white wine-butter sauce. Shave zucchini lengthwise into very thin ribbons with peeler, or use a mandoline. For each piece of fish, arrange about 5 slices of zucchini on a work surface, side by side, overlapping each slice by half. Brush zucchini with oil, then lightly season with salt and pepper. Lay fresh herbs across center of each group of zucchini slices. Pat fish dry, then sprinkle with kosher salt and lemon pepper and arrange crosswise on zucchini, covering herbs. 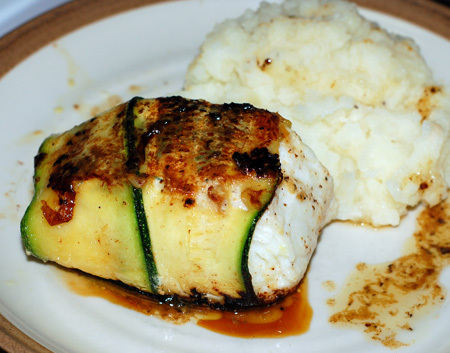 Top each piece of fish with more herbs, then wrap zucchini around fish, overlapping ends. This can be done several hours in advance, if desired. Put 1 tablespoon oil in a 12-inch nonstick skillet and swirl to coat bottom, then arrange fish, seam sides down, in oil. Lightly brush tops of zucchini and fish with oil. Cover skillet and cook fish over medium heat, without turning, until barely cooked through, 6 to 9 minutes, depending on thickness of fillets (fish will continue to cook from residual heat). Turn heat up to medium high and continue to cook just until the zucchini begins to brown, then carefully turn and brown the other side slightly.